Anyway, hop on over to Legends Undying if you haven’t been over there in a while, load up on your favorite snack and drink, and read some wonderful short stories. And make sure to “like” or comment on the one(s) you think are best. Readers We Need Your Help! “There Be Dragons Here” Reader’s Choice Award! 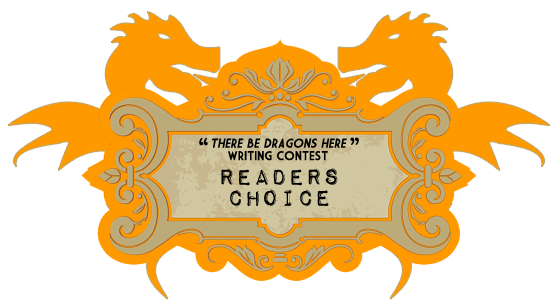 There’s Just 4 Days Left in our “There Be Dragons Here” Writing Contest… And Amongst the Awards That will be Given Out, one of them is The “Reader’s Choice” Award. I use several methods in Determining The Winner of This Award, and one of the ways is By How The Readers React, and Respond to the Pieces, Via Clicking ‘Like’, and or Commenting on the Pieces. There are other ways as well, but In These Ways you can Help us! With our Other Three Awards, Our Panel of 6 Judges will be Reading, and Voting… But the “Reader’s Choice” Award is an opportunity for You, Our Readers, to Have Your Say/Give Your Opinion! I’m sure you voted for the perfect one! I am a judge so I can’t enter a story, although my mind had been brewing about a “Dragon Lady.” Maybe I’ll post something very different from my normal zany stuff after the contest is over. Reading all these entries has inspired the creative writer in me! Lorna, which one is yours?? I can’t find your name. aauugh! Which is your story? I think I voted on the wrong one. Yes, got to get the word around…and I suppose we should go as readers and make a choice too, huh?